NOTE: Contact the Registrar's Office for current information, transcript/diploma requests, and attendance verification. Click here. From I-70: travel South on Providence Rd., turn East (left) on Turner Ave. which will take you to either parking option. From Hwy 63: travel West on Stadium Blvd., turn North (right) on Providence Rd., then turn East (right) on Turner Ave. which will take you to either parking option. 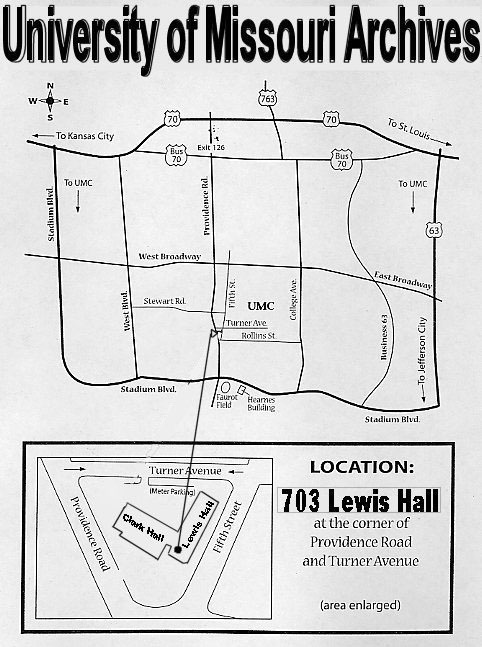 Park in Lot WG-11 on the west side of Lewis Hall or Lot WG-10 located northeast of Lewis Hall immediately west of the Conley House. There are metered spots in both lots. The University Archives is often mistakenly contacted for enrollment and registration information, especially concerning transcripts and diploma replacement.